Deprenyl was developed by Professor Joseph Knoll of Semmelweiss University in Hungary in the early 1960's as a 'psychic energizer' and antidepressant (Knoll, et al, 1965). It was later found that when Deprenyl was administered in conjunction with other agents for Parkinson's disease, it significantly improved the results (Birkmayer, et al, 1977). Parkinson's is a debilitating illness, characterized by progressive dementia, unsteady gait, and tremor, ultimately resulting in death. Parkinson's is thought to be caused by a loss of dopamine producing nerve cells in a portion of the brain called the substantia nigra, resulting in a deficiency of the stimulatory neurotransmitter, dopamine. Prior to age 45, dopamine levels remain fairly stable. Starting at about age 45, average dopamine content in healthy individuals decreases linearly, about 13% per decade. When the dopamine content in the brain reaches about 30% of normal, Parkinson's symptoms may be present. When levels reach 10% of normal, death ensues. Some neuroscientists have said that if we lived long enough, we would all get Parkinson's disease. 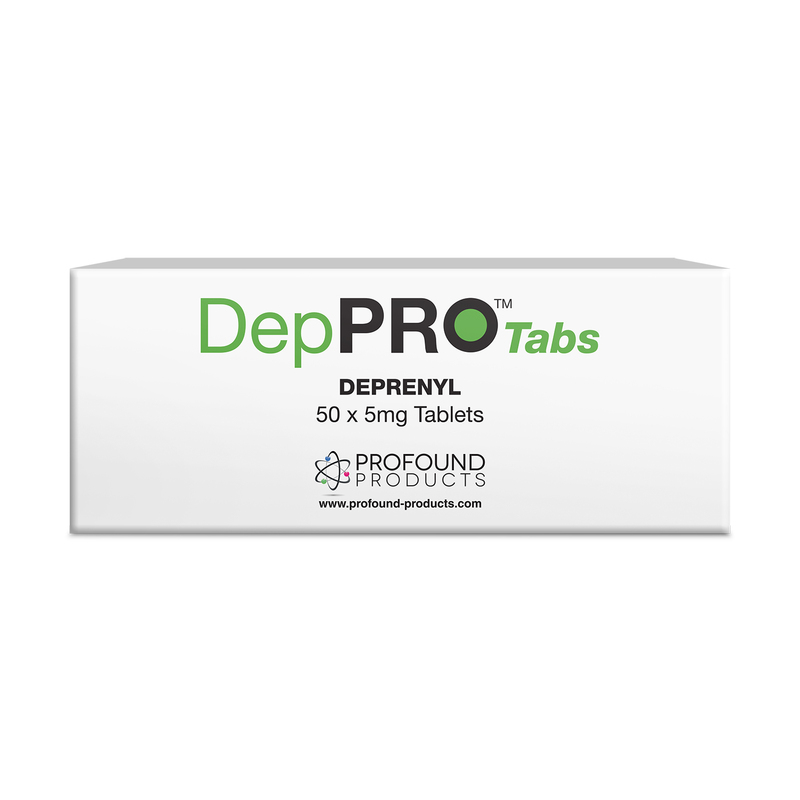 Deprenyl was for many years a relatively obscure drug, used only in Europe and Latin America for its officially approved indication as an adjunctive treatment for Parkinson's disease; until a bombshell article appeared in a highly specialized, extremely limited circulation professional journal (Knoll, 1988). In this article, Professor Knoll reported the results of longevity experiments on rats, which had been treated with Deprenyl. In his studies, Professor Knoll found that the rats treated with Deprenyl lived up to 40% longer than the control rats! In subsequent interviews, Professor Knoll revealed that he believed so strongly in the potential life extending benefits of Deprenyl, that he himself took two 5mg Deprenyl tablets each week, and believed that nearly everyone over the age of 45 should take Deprenyl as a preventative against aging. With a few exceptions, most subsequent studies by Knoll and others confirmed the longevity enhancing effects of Deprenyl, even though none of the more recent studies produced results as dramatic as Knoll's original report (Kitani, et al, 1993; Milgram, et al, 1990; Ruehl, et al, 1994). In addition to its potential as a life-extending drug, Deprenyl also appears to have a number of other beneficial effects. One of the most significant is its libido promoting/aphrodisiac effects, in both men and women. Knoll and colleagues (1983) again first reported indications for its potential in this area. Knoll reported in scientific terms about the increased 'mounting frequency' and intromission of old male rats when treated with Deprenyl, which contrasted dramatically with the untreated controls. Anecdotal reports from many of my patients regarding their own 'increased mounting frequency' seem to confirm Knoll's findings about aphrodisiac effects. It was originally proposed by Knoll (1978) that the mechanism of action of Deprenyl was strictly due to it being an inhibitor of monoamine oxidase B (MAO-B). MAO is a neurotransmitter that is responsible for metabolizing used neurotransmitters so that they can be excreted. MAO levels tend to rise with age, causing a resultant decrease in monoamine neurotransmitter (like dopamine). MAO inhibition can correct for this age-related decrease in neurotransmitters. There are now known to be two types of MAO; A and B. Deprenyl was the first selective MAO-B inhibitor to be described in the literature, and it has become the standard. Recent research indicates that Deprenyl may possess a number of unique properties, which are not related to its MAO-B inhibition activity (Berry, et al, 1994). Deprenyl has also been found to protect neurons from toxic substances, act as an anti-oxidant, and as an inducer of the anti-oxidant enzymes superoxide dismutase (SOD) and catalase (CAT) (Kitania, et al, 1994). Although Parkinson's disease remains the only FDA approved indication for Deprenyl in the USA, with a number of ongoing clinical studies evaluating its efficacy in Alzheimer's disease, anecdotal reports from both physicians and patients of dramatic improvement in an impressive number of diseases have been piling up. Dr. Clyde Reynolds, a brilliant clinician who specializes in the metabolic therapy of cancer in Washington State, discovered that cancer patients invariably have imbalances of the neurotransmitters, epinephrine, norepinephrine and serotonin. Dr. Reynolds has found that Deprenyl is highly effective in restoring the normal levels and normal balance of these neurotransmitters. He believes that normalization of the balance of these neurotransmitters is an absolute necessity for the effective treatment of all cancers. In addition to Reynold's report about normalization of brain neurotransmitter balance, are a considerable number of anecdotal reports from patients and physicians of the ability of Deprenyl to increase levels of DHEA. Recommended dosage regimens for Deprenyl in the above mentioned conditions are available from IAS. As stated previously, Professor Knoll is a man who 'practises what he preaches' and reportedly takes two 5mg Deprenyl tablets per week. We (Dean, Fowkes and Morgenthaler) recommend the following age adjusted titrated dosage schedule in our book, Smart Drugs 2. Kitani and his colleagues (1996) found that the optimum dosage of Deprenyl, (which caused the greatest upregulation [increase] of antioxidant enzymes [SOD and CAT] in the brain in long-term studies) decreased by a factor of 5 (or 10). This was compared with the optimal dose in relatively short-term studies (3 weeks). Unfortunately, by the time the results were calculated which showed the greater efficacy of reduced dosages of Deprenyl in long-term studies, Kitani's group had already nearly completed another study using the much higher dose calculated from the short-term studies. Contrary to the researcher's expectations, the Deprenyl treated animals (given the high dose of Deprenyl based on the short-term studies), lived shorter lives than did the controls! Kitani's group is now repeating the study using the much lower Deprenyl dose that was determined to be most effective from the long-term studies. Their work in progress appears to confirm that this lower dosage will result in life extension benefits for the Deprenyl treated animals. Consequently, in view of the results of Kitani and colleagues, I recommend that my life extension patients consider the recommended dosages above as 'starting dosages,' and that they consider reducing their dosages somewhat after several months. Deprenyl hydrochloride (Selegiline, Jumex etc) is the prescription form that is most widely prescribed by the orthodox physicians. Liquid Deprenyl Citrate (LDC) is Selegiline, which is considered to be superior. This form is generally recognised as the most pure and potent form of Deprenyl available. It also allows precise titration for anti-aging purposes, as each ml drop in the bottle is equivalent to 1mg deprenyl citrate. Berry MD, Juorio AV, Paterson IA. Possible mechanisms of action of (-) deprenyl and other MAO-B inhibitors in some neurologic and psychiatric disorders. Prog Neurobiol, 1994, 44; 141-161. Birkmayer W, Riederer P, Ambrozi L, Yine, Poudim MBH. Implications of combined treatment with Madopar and deprenyl in Parkinson's disease. Lancet 1977, I 439-444. Dean W, Morgenthaler J, Fowkes S. Smart Drugs 2, 1993, Smart Publications, Petaluma CA94955. Kitani KS, Kanai S, Sato Y, Ohta M, Ivy GO and C. Chronic treatment of (-) deprenyl prolongs the life span of male Fischer 344 rats; Further evidence. Life Sci, 1993; 52 281-288. Knoll J. The possible mechanism of action of (-) deprenyl in Parkinson's disease. J Neural Transmission, 1978, 43: 239-244. Knoll J. The striatal dopamine dependency of life span in male rats. Longevity study with (-) deprenyl. Mechanisms of aging and development. 1988, 46 (1-3); 237-262. Knoll J. Ecsery Z, Kelemen K, Nievel J and Knoll B. Phenylisopropylmethylpropinylamine (E-250), a new psychic energizer, Arch Int Pharmacodyn. Ther 1965; 155; 154-164. Knoll J. Yen TT and Dallo J. Long lasting true aphrodisiac effect of (-) deprenyl in sluggish old male rats. Mod Prob Pharmacopsyychiat, 1983, 138-153. Milgram NW, Racine RJ, Nellis P, Mendonca A and Ivy GO. Maintenance of L-deprenyl prolongs life in aged male rats. Life sci 1990, 47; 415-420. Ruehl WW, Bice E, Muggenburg B, Bruyette and Stevens DR. L-deprenyl and canine longevity. Evidence for an immune mechanism and implications for human aging. 2nd conference on anti-aging medicine, Las Vegas NV 1994 abstract pp 25-26. Kitani KS, Kanai S, Sato Y, Ohta M, Ivy GO and C. Upregulation of antioxidant enzyme activities by deprenyl in: pharmacological intervention in aging and age related disorders, Annals NY Acad Sci, Vol 786, New York 1996 pp 391-409.